Order your highly desired 1/20 oz 999 fine gold panda at the best price through our online store! The gold panda series is an ever evolving story with the infamous bear displaying a unique pose each year. In 1984 the pose displayed is of a panda bear playfully embracing a bamboo branch. The reverse of this brilliant coin depicts the Beijing landmark of the 'Hall of Prayer For Good Harvests' encircled by the classic legend of 'The People's Republic of China' with the mintage and the date. Achterzijde A panda clutching a bamboo branch. A panda clutching a bamboo branch. 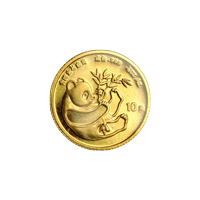 1/10 oz 1984 Chinese Panda Gold Coin Order your highly desired 1/20 oz 999 fine gold panda at the best price through our online store! The gold panda series is an ever evolving story with the infamous bear displaying a unique pose each year. In 1984 the pose displayed is of a panda bear playfully embracing a bamboo branch. The reverse of this brilliant coin depicts the Beijing landmark of the 'Hall of Prayer For Good Harvests' encircled by the classic legend of 'The People's Republic of China' with the mintage and the date. This gold panda coin is extremely low mintage, with only 86,464 coins in circulation and is perfect for both collectors and investors. Secure yours today!